Yesterday was another beautiful spring day, clear & bright and even quite warm. 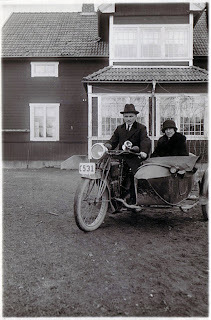 Along the coast of Southern Norway you find loads of nice paved single lane roads ideal for motorcycling. Its something different touring close to the sea, the smell is so different from what I am used to living up the vallleys. Ulvøysund, used to be a small community of fishermen and coast guards. Now all houses are high bucks summer homes for whealty people. Its cool to go there of season and have it all by yourself! 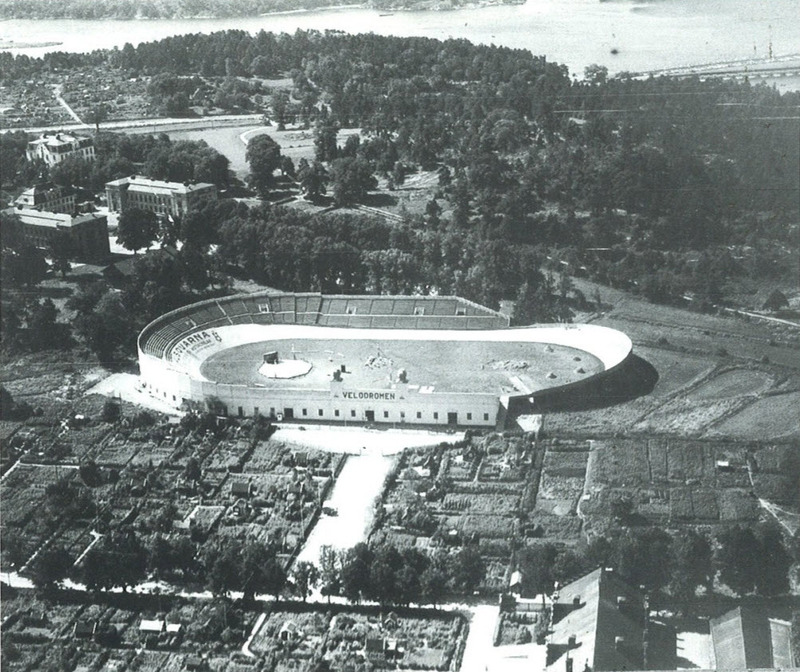 People should still be living here. there is always this wind blowing when your at "lands end" and the horison is next. Lillesand, one of the "white towns" of southern Norway. Packed during the summer holliday season and dead quiet all the rest of the year. As I was obviously to onconscious to see this great arrangement advertised in the NVMC magazine a post on the "beveldrive.blogspot.com" made me aware. I called Stig and he picked me up to join him to Gardermoen, thanks! This event was not supposed to be "real" racing, but hey how long did that last? 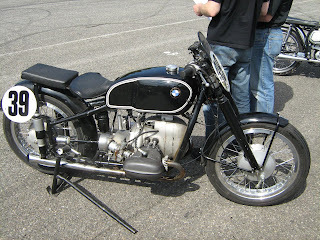 Great Wednesday with cool motorbikes and many old racing caracters. 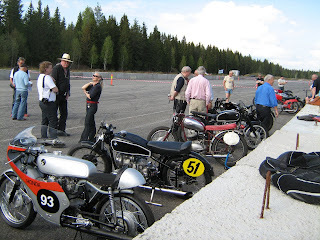 Matchless G50`s? 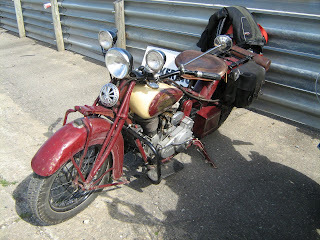 and Stigs BSA Goldstar racer. 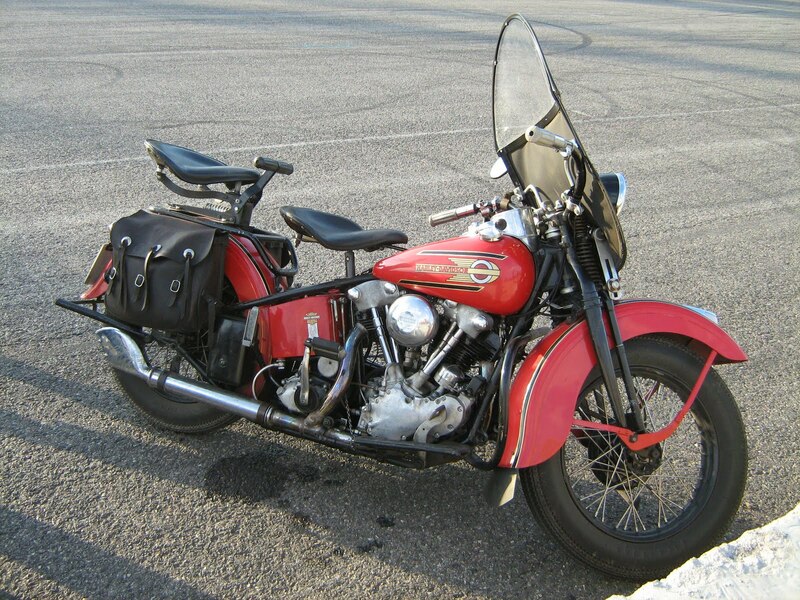 30`s chief with electric start!!!!!! This 80 years young gentleman raced a Jawa on the Isle of Man in 1951-53. 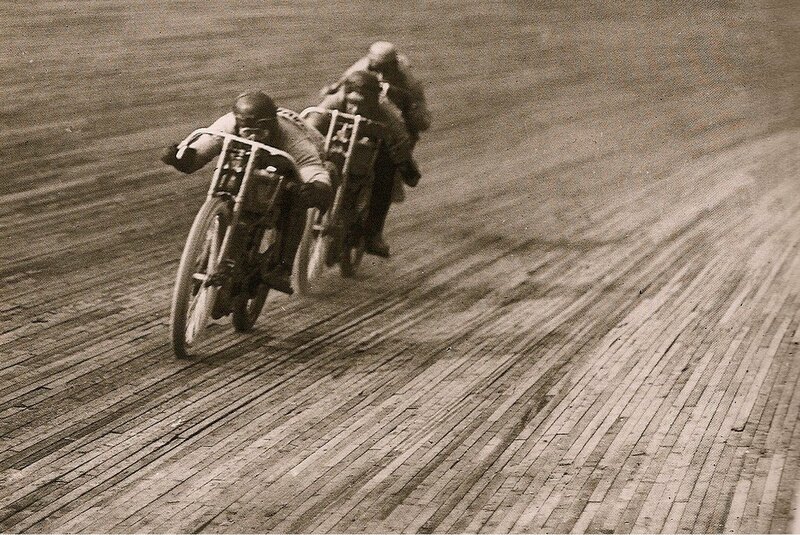 He still raced the same bike using the same leather! Honda (Hrmm), BMW, Jawa and another Beemer. Those BMW`s sound awesome when throttled up. Bengt was there riding his beatuiful 1930 VL combination. This is a runner! 38 or 39 Knuckle was spotted in the pits area. way cool bike. Find it good to know I can dress up for any occasion. 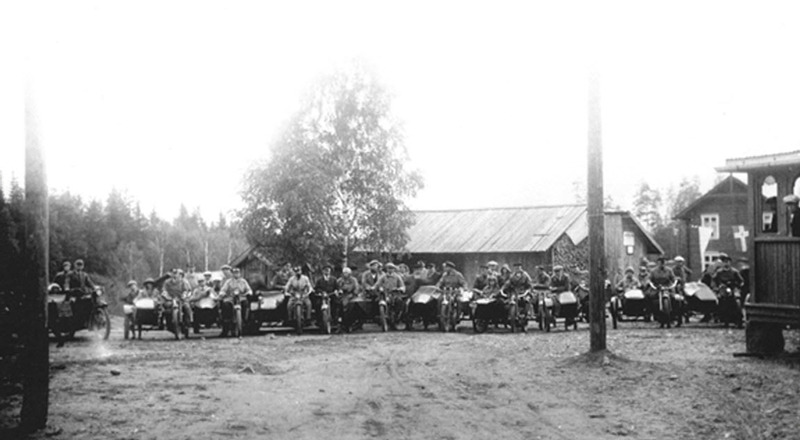 One more photo from Rjukan Motorcycle club taken in 1924. 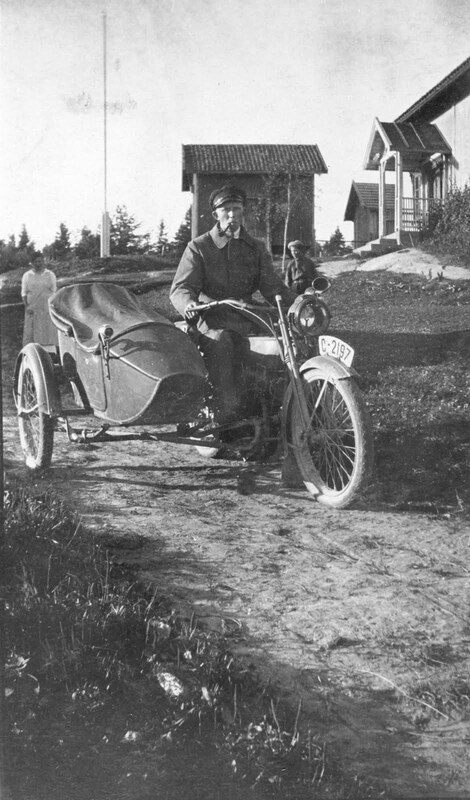 This image show Mr. Sørensen and his Harley combination taking a rest during a local hillclimb race. 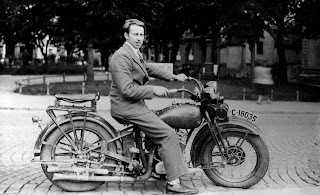 Late teens Harley F model, ignition by magneto and lights lit by acetylene. The passanger seat with back rest is a cool detail. This Harley is pretty much identical with the bike above except from the sidecar beeing on the right hand side. 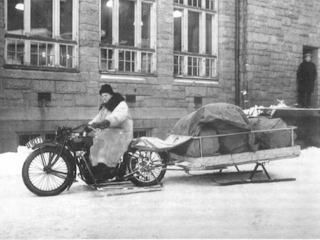 Kind of strange as this is a Swedish combination and back then the Swedes drove on the "opposite" side of the road. All dressed up and ready to go, Harley J model from 1926 or 27 with original sidecar. Its due time to get some new tires as the two visible ones seems to be rather slick. "the American Racer 1900 - 1940". 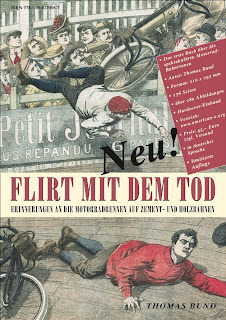 Whow, this book is a must have. Large and heavy with huge format pictures letting the reader get an excelent view of the details in the pictures. 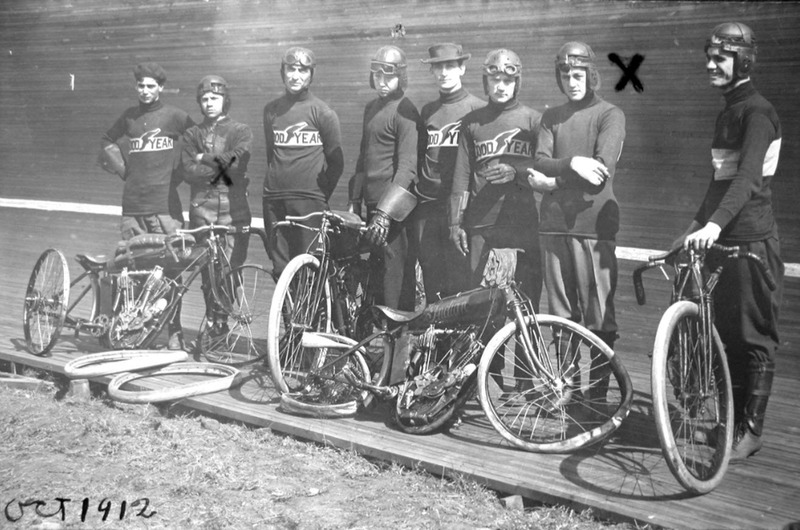 Later on the board track racing history published by Statnekov on the internet added to the inspiration and interrest (link further down this post) in this sport. 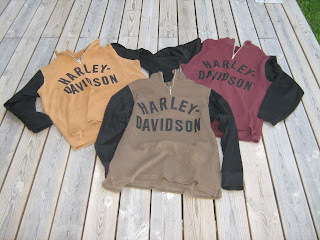 It`s a must to own. 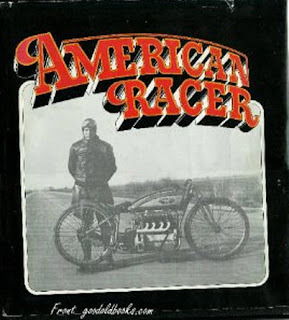 As soon as I learned Thomas Bund, from wich I previously had bought the excelent American-X book - had released a new book on board track racers I placed an order with him. It is just fantastic too, and one can learn a lot from the european board track racing scene as well as there is unseen footage from the US. 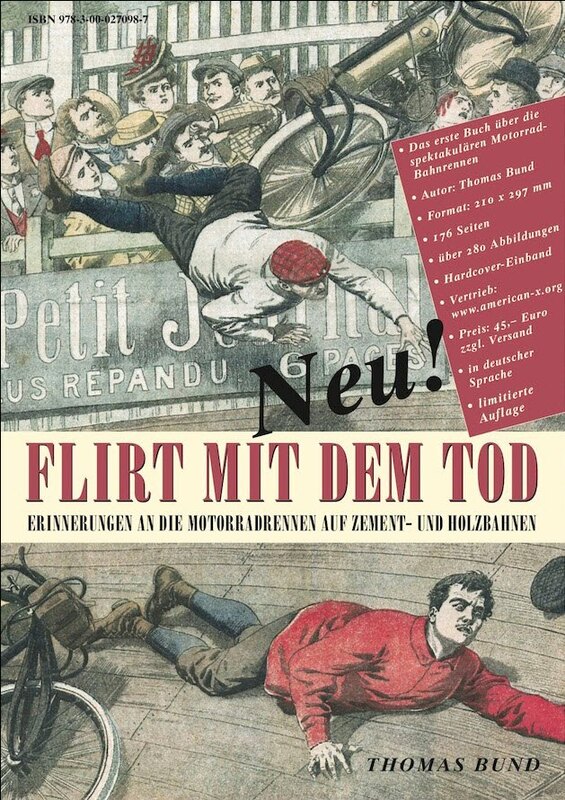 This book was printed in 300 copies only, maybe there are still some left? 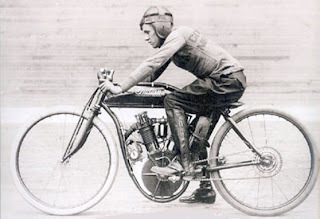 This is an early Excelsior boardtrack racer, it looks so fragile that it sounds unreal those motors where wound up to speeds exceeding 100 mph. Imagine 100 mph on a slippery wooden surface with no brakes, suspension and not even a throttle. Just a cut out switch to kill your magneto whenever the finnish line is passed. 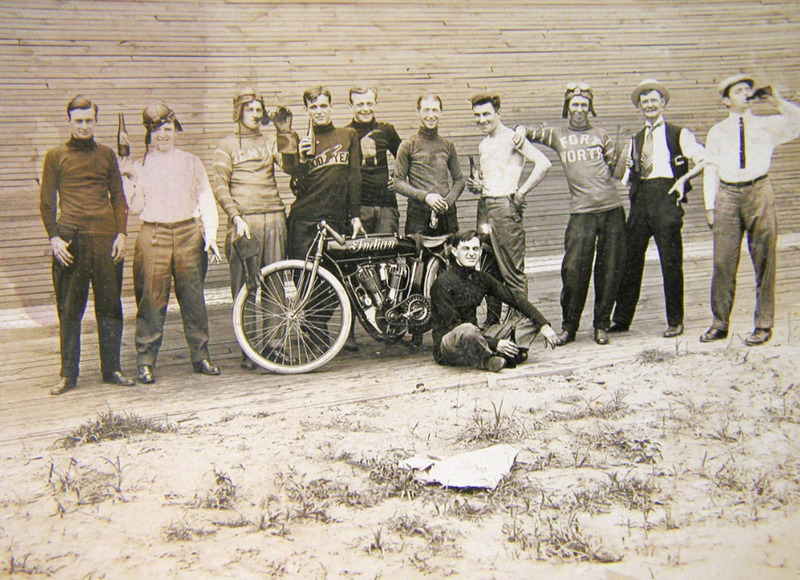 An early Indian racer at right, wich is easily recognizeable with its handlebars built in three parts. 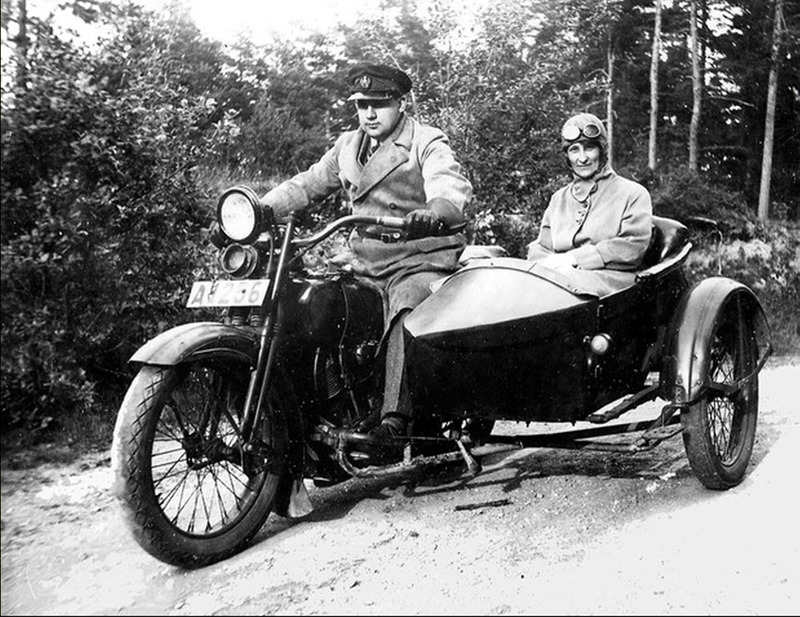 An Excelsior to the left with a Merkel fork up front (Flying Merkel). 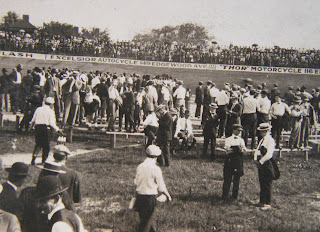 There where plenty of room for the spectators inside the racing circuit where there allso used to be locations for the various teams competing. 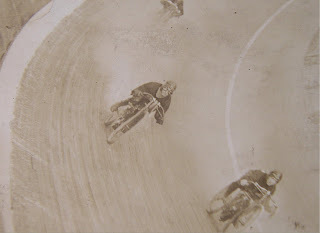 Said this before, imagine stretching out your motor at full throttle (if you ever had one) passing 100mph on a track made of 2" by 4"`s (they where placed upright such as the 2" part was making the track surface), all slippery as the motors have total loss lubrication and if you go down you will get splinters all over from the track. 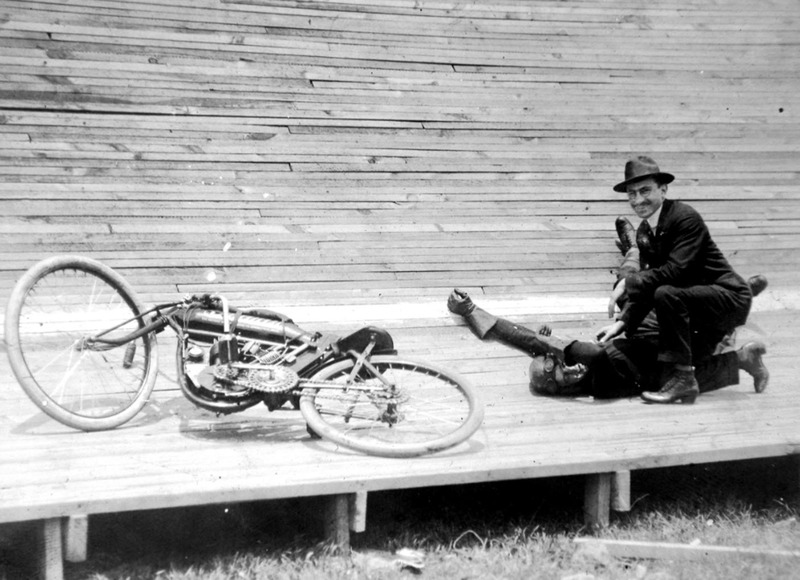 This men where daredevils for sure. 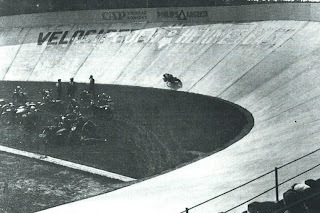 Bankings trough the curves could go 60 degrees steep, no way you could get up this wall if you released your speed any. Celebrating with booze and beer. Survived, maybe even got a part of the price money. 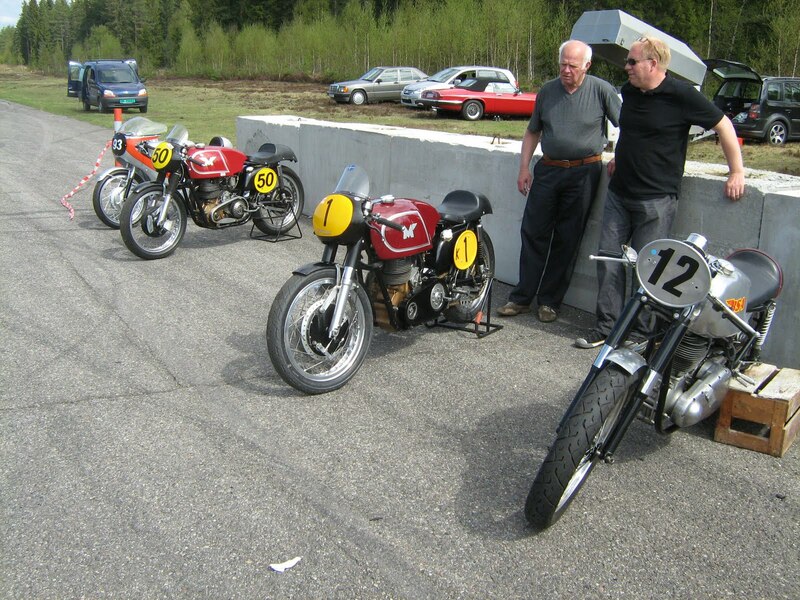 These guys all raced for hard cash. If you won there could be high money involved. But then as now, "what easy comes easy goes"
This image show the back side of the medal, getting into a slide, maybe run over and surely full of splinters. This group of Indian racers seem to have been trough a tough day at the track. 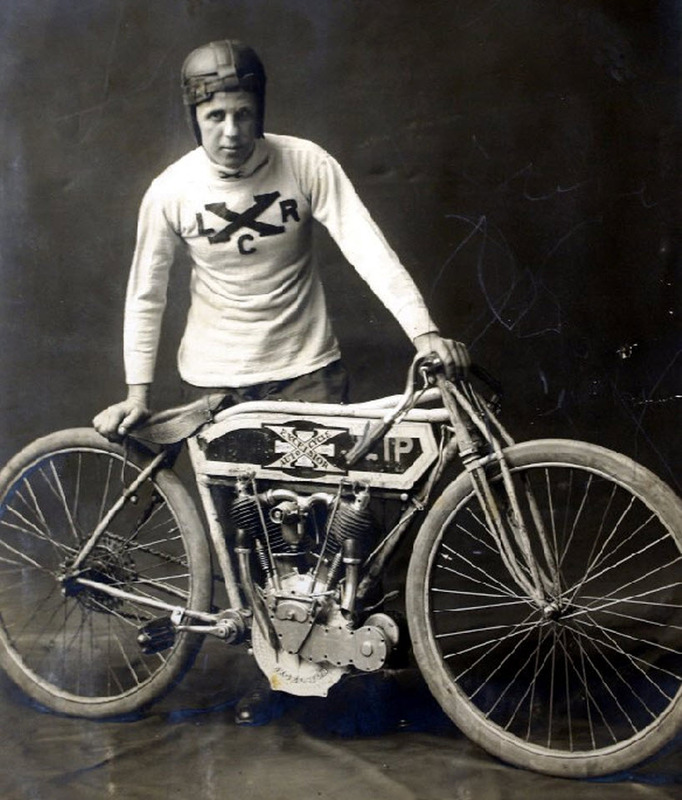 This is the only video I know where the bike presented is a 100% true original racer as 99% of the racers seen today are excellent replicas of yesterdaze racers. Make sure your volume is crancked up to HIGH to give yourself an idea what this motor sounds like. Imagine trying to control this beast on slippery planks at 100mph. Check out the forum, pre 1916 motorcycles and you will find more photos on early racers. 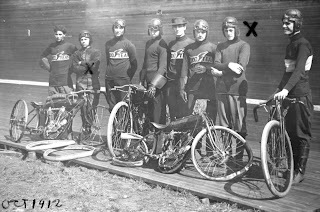 The American boardtrack racing history, online book. Great reading. OK, we never had any boardtracks in Norway as we was a poor country back then. Our neighbours in Sweden had one in a town Hornsberg. Advertising inside the circuit is for Swedish Husquarna motor-cycles. 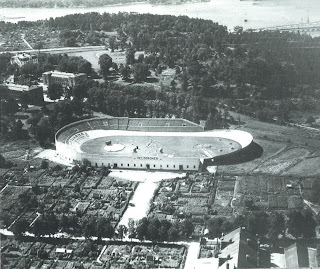 The Hornsberg track was made of concrete. Did we race with American motorcyles back then in Norway? 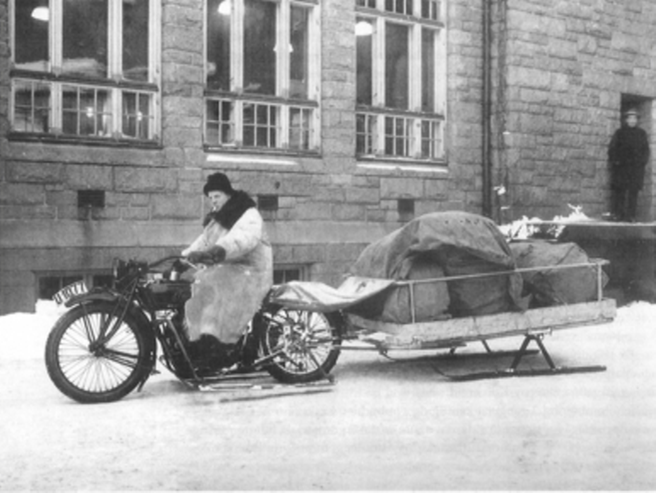 Yes indeed we raced on ice, on the streets, up hills or on horse race tracks. But this is all another yet untold story. 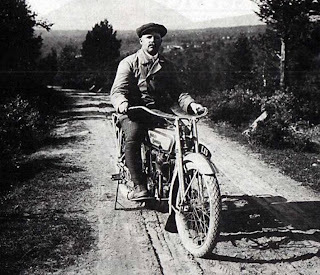 This image show what roads a motorcyclist would be driving in the rural parts of Norway in the late twenties. 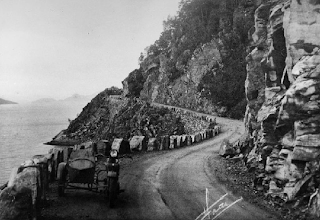 You could expect loose boulders from above and just some stones standing every now and then along the road to prevent you hit the fjord by an accident. 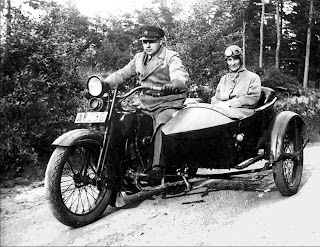 Late twenties IOE Harley with sidecar. Here is one cool photo where the sidecar guys belonging to Rjukan Motorcycle club line up for a photo back in 1925.
at far left is the homebrew 4 cyl. 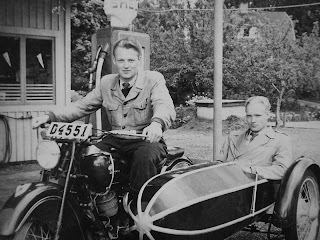 Spanjola based on two Indian Powerplus engines (seen in an earlier post) with its caracteristic sidecar. The trunk have a window in the front for the dogs to look out when on the road. Aint that cool? Obviously there are more kids who want to join the sidecar for a ride. 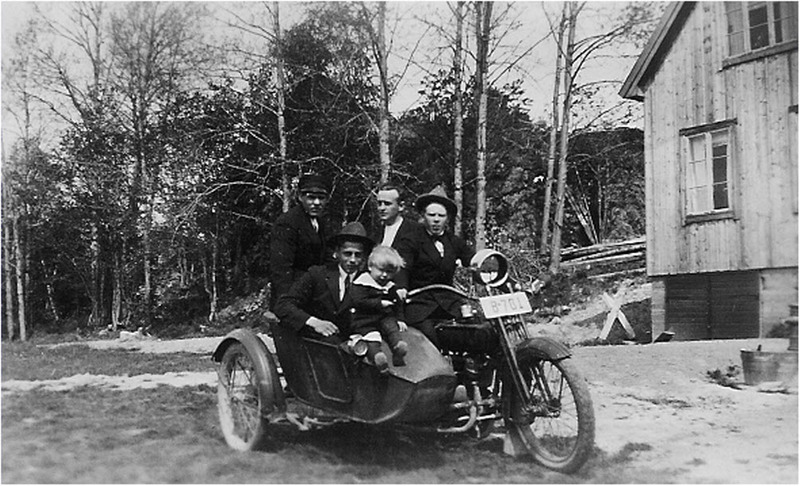 Harley 1925 - 27 j electric model with original sidecar. 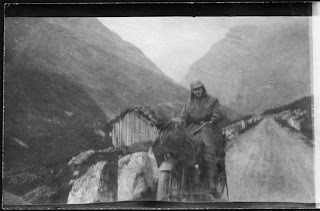 This pic is of rather low quality, tough most likely its taken by a box-camera and hence not to bad after all. The box camera is just as it says, a box with a roll of film and a shutter. No-nonsens such as optics or electronics or anything alike. This camera type was what you could expect the average guy (or girl) to own pre WWII. 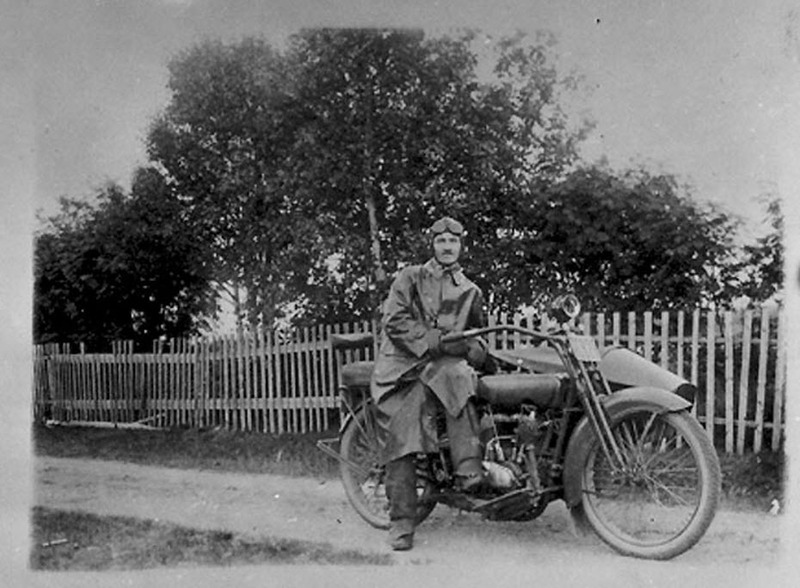 mother Fanny as young lady. 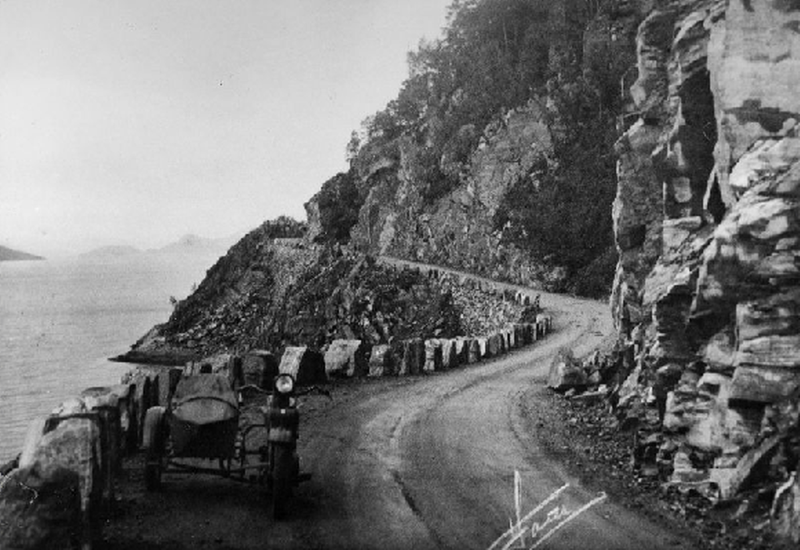 Pic is taken in 1922 according to what Jens knows of its history. 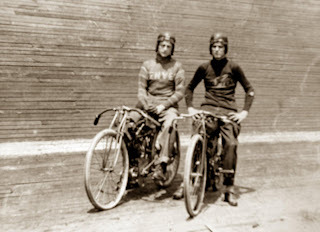 Jens is restoring two old Harleys, a 1923 and a 1928 (previously pictured under "as found"). Harley Davidson model F (Magneto model with Acetylene lights) from aprox 1920 to 23. Wonder how the ride will affect on the riders pipe? 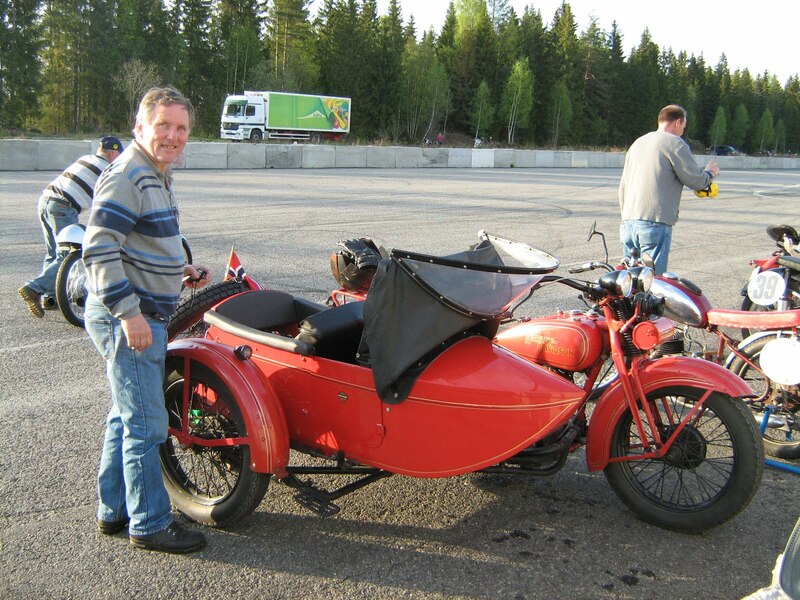 This great looking Harley VL with sidecar from 1929/30 is ready to start in an endurance run held in Trondhjem. 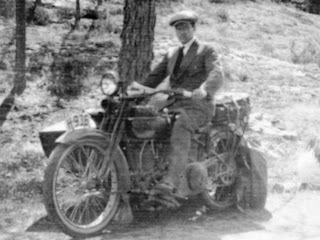 1929 & 30 where the only years the VL was equipped with thw twin baby bullet headlights. This headlamp setup looked cool but was innefective. 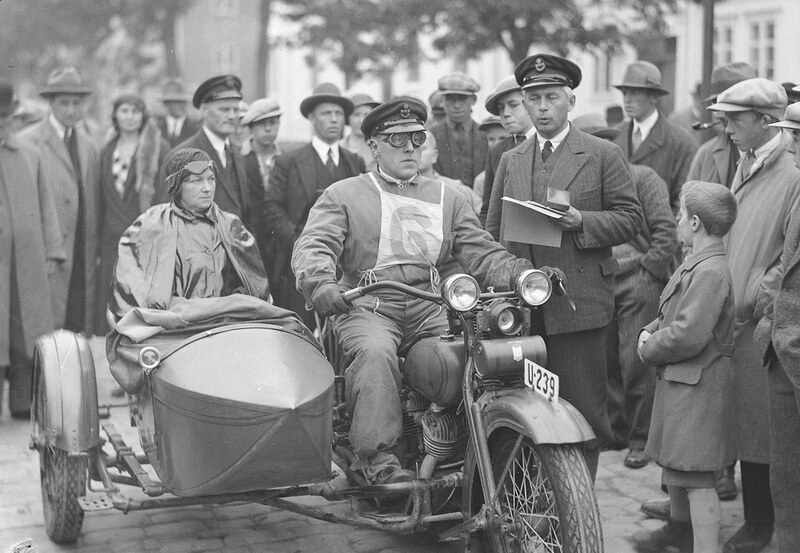 The VL rider is a member of NMK, The "Norwegian Motor Club" as seen from the badge on his hat. Two young lads with an Indian Chief (not bad for a youngster). Seems like a Danish Bender is fitted to the left. 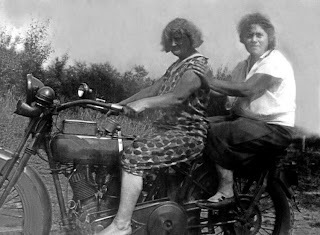 Motor maids ready to take the ol Harley out for a spin at the countryside. 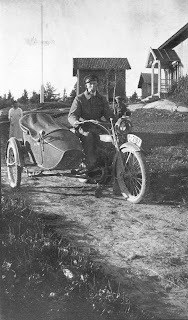 Harley IOE from 1916. This year was the last year you could buy a Harley with bicycle style pedals operating the gearbox to drive the bike forward. This gearbox came in 15 as was optional in 16 to be obsolete for the 17 models and onward. 1929 Harley Davidson model DL. These 45"`s (750 cc) sold really well in Norway even if there where quite a bit of problems with them. The generator drive (generator standing next to front cylinder nick named those "the three cylinder HD") gear was a weak point. Whilst surfing the WWW I came across this nice shoot showing three cool young fellas and their motors. 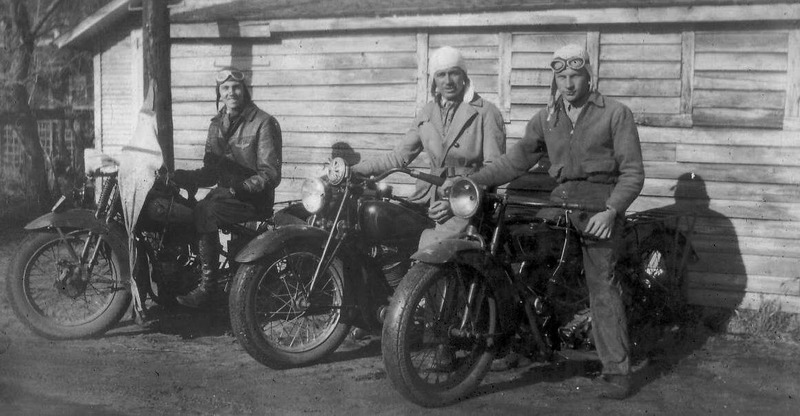 Left to right; Super X 1929 to 1931, Indian Sports Scout and another cool Super X 1924 to 1927 (1928 had frontbrake as the later models). Wonder wich of those chaps where running the faster mount? 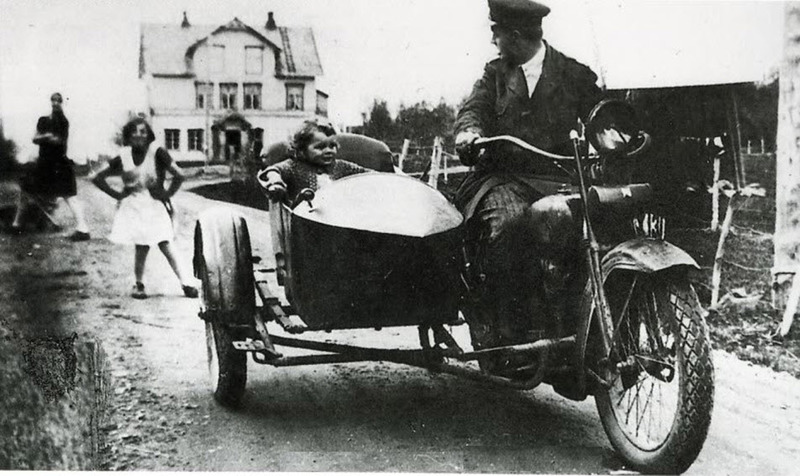 Just recently found this cool photo showing a 1926-27 baby Harley and its proud owner. 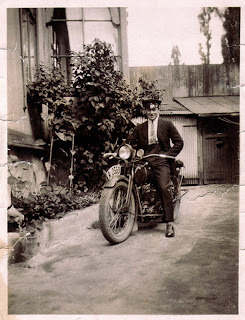 Pic is taken in Oslo late twenties. 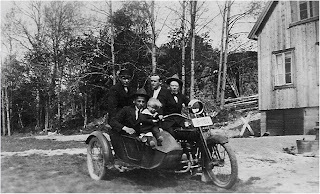 Excelsior with sidecar from around 1920. Magneto model with acetylen lights allround. You need to grab the ball horn to get people out of the road. 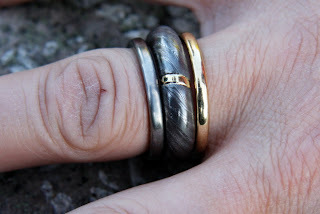 Damascus steel could be used to other than knifes, swords and guns too, such as a ring as shown in photo or even details on your motorcicle? Front piece is Titanium from the scrapbin at a local chemical factory, second is 300 layers damascus twisted to get a improved pattern with gold inlay and third is a piece of gold rolled to square and soldered. This post was obviously not motor related, but hey I used my skills from wrenching my motorcicles when I made this piece for my girlfriend.